Brown J, Welding K, Cohen JE, Cherukupalli R, Washington C, Ferguson J, Smith KC. An analysis of purchase price of legal and illicit cigarettes in urban retail environments in 14 low- and middle-income countries. Addiction 2017; 112:1854–1860. doi:10.1111/add.13881. Cohen JE, Brown J, Washington C, Welding K, Ferguson J, Smith KC. Do cigarette health warning labels comply with requirements: A 14-country study. Preventive Medicine 2016. doi:10.1016/j.ypmed.2016.10.006. Iacobelli M, Smith KC, Washington C, Welding K, Cohen JE. When the tax stamp covers the health warning label: conflicting ‘best practices’ for tobacco control policy. Tobacco Control 2018; 27:119-120. doi:10.1136/tobaccocontrol-2016-053417. Iacobelli M, Saraf S, Welding K, Smith KC, Cohen JE. Manipulated: graphic health warnings on smokeless tobacco in rural India. Tobacco Control 2019; [Epub ahead of print]; doi: 10.1136/tobaccocontrol-2018-054715. Kleb C, Welding K, Cohen JE, Smith KC. The use of sports imagery and terminology on cigarette packs from fourteen countries. Substance Use & Misuse 2018; 53:5, 873-880. doi:10.1080/10826084.2017.1363236. Ross H, Vellios N, Smith KC, Ferguson J, Cohen JE. A closer look at Cheap White cigarettes. Tobacco Control 2016; 25:527-531. doi:10.1136/tobaccocontrol-2015-052540. Smith KC, Welding K, Kelb C, Washington C, Cohen JE. English on cigarette packs from six non-Anglophone low- and middle-income countries. International Journal of Public Health 21 September 2018; doi: 10.1007/s00038-018-1164-9. Smith KC, Washington C, Welding K, Kroart L, Osho A, Cohen JE. Cigarette stick as valuable communicative real estate: A content analysis of cigarettes from 14 low-income and middle-income countries. Tobacco Control 2017; 26:604-607. doi:10.1136/tobaccocontrol-2016-053148. Smith KC, Washington C, Brown J, Vadnais A, Kroart L, Ferguson J, Cohen J. 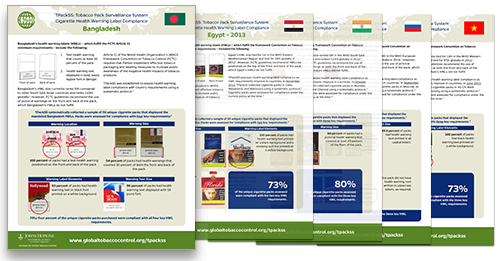 The Tobacco Pack Surveillance System (TPackSS): A protocol for assessing health warning compliance, design features and appeals of tobacco packs sold in low- and middle-income countries. JMIR Public Health and Surveillance 2015; 1(2):e8. doi:10.2196/publichealth.4616.